The frame weight capacity is 1000 lbs. Weight capacity of the bed is 300 lbs per bunk. Bed Size: 43 In. (W) x 62 In. (H) x 81 In.(L). A Bunkie Board, Slat roll or Bunkie Mattress must be used with this bed. Richmond 3 In. Post Twin/Twin Bunk Bed. This Bunk Bed Is Perfect For Your Home. Available In Two Colors: Mahogany And Honey Pine Finishes. Strong Construction. Easy To Assemble. Bunk Bed Includes:* Twin Over Twin Bunk Bed. * 100% Solid Wood Brazilian Pine. * Extra Tall - 66 In. High. 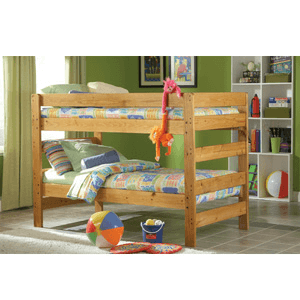 * Extra Space Between Top And Bottom Beds For Comfortable Seating. * No Bunkie Boards Required. * 26 Slats Included - 2 Packs Of 13-Piece Roll-Out Slat System. * Separates Into 2 Twin Size Beds. * Metal To Metal Connections Provide Incredible Sturdiness And Stability. * Pre Assembled Headboards And Foot boards. * Non-Toxic Durable Finish. Mattresses Are NOT Included In The Price.Size: 80 1/2 In. (L) x 44 In. (W) x 66 In. (H)See Below For Related Items. The Arizona has a clean, modern look with subtle Mission styling. The solid hardwood construction has 26 steel reinforcement points and the high build finish is both durable and beautiful. Mattress and Under bed Drawers are not included in the price. Separates into two Twin Beds if needed.Dimensions: 67 In. x 41-1/2 In. x 79 In.